I have't seen any real evidence of massed use of archers in Northern Europe before the English started using them in great numbers from 1300 (?). It coincide with the development of very strong bows, so my gut feeling tells me that it's a new battlefield development. About round shields from the Viking Ages we only have 1 fairly complete one from Denmark and then also a number of partial shields from Norway. Then from the Iron Age you have 2 round shield from Thorsbjerg Mose and that is a deposit from 200's AD, so perhaps these are the earliest round shields, though you have found round shield from the Nordic bronze age as well? A viking shield found at Trelleborg ringfort on Sjælland gives us a precise date of the 980's. It is 80 cm in diameter. The men stationed at Trelleborg was an army, so it's with all certainty a shield for battle and not for duels. So axe is most likely not a reason for the change of shield shape. Thanks for your shieldwall explanation - quite interesting! So it is the Aristotelian scientific thinking that might revolutionize sword teachings at some point in the middle ages? Could probably be true, but so hard to say when it began: Boethius Latin translations of Aristotle (for instance "The Catagories") had not been lost in the Western World and was available all through the middle ages and used in the Monastic and University teaching. The "quadrivium" was likely formulated and introduced by Boethius (480-524)! Especially the "Commentary on Aristotle's Metaphysics" by Ibn-Rushd/Averoes became important in the early 1200's, though it met a lot of opposition that almost crushed it. Funny enough one of the two leaders who fought for introducing the Averoesian/Aristotelian philosophy at the Paris University was another Boethius - this guy was Danish though: Boethius of Dacia latinized for "Bo af Danmark" [Denmark was commonly called Dacia in the middle ages if any Romanians get confused by that]. Accused of being "Averoesian" he had to flee Paris in 1277 with his philosophical-comrade-in-arms Siger of Brabrant as their movement was deemed heretical. So the real take off for Averoesian/Aristotelian thought on a broader level is from early 1300's, when the English Franciscan friar William of Ockham/Occam (called Venerabilis Inceptor, “Venerable Beginner”) cuts the way with "Occam's razor" even today a fundamental of science like cladism of paleontology. Teachings of Ockham became the "Via Moderna" in conflict with Thomas Aquinas that became the "Via Antiqua" (Aquinas tried to fuse Aristotelian reason and faith together, which faith superior if in conflict with reason). Later a guy named Martin Luther studied "Via Moderna" and learned to split knowledge and faith into two separate compartments! Germanic people had professional warriors (and also professional duelist according to the sagas) doing nothing else all their life at least from the Iron Age, many working for Romans then attacking Romans or other Germanic people. I would think that the books starting to be published - I.33 as the first we know about from exactly around 1300 - might be from classical inspiration, but advanced fighting skills must have been taught for generations (just not put into any sophisticated more scientific system based on catagories - and that is the real revolution). Whether fatal blows to the abdomen would give spinal injuries depends very much on angle - it would think many would have been dying fast or slowly over days from stomach wounds not giving any skeleton marks. The Oxford and Ridgeway Hill examples shows in my opinion massacre like injuries (probably extensive torture before final death). The Fishergate example from York is much better since you have varied types of injuries. 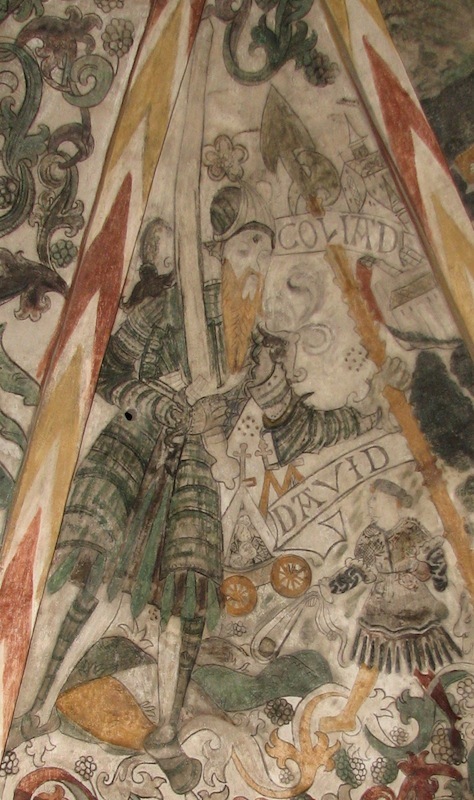 A fresco from Brönnestad, in Southern Sweden (formerly Danish territory), dated c. 1440, very clearly shows long-gripped swords in the hands of Herod and his soldiers. The flaring quillons match the distinctive Scandinavian group that Oakeshott identified as 'family K', and the blade shape seems very similar to D4850 in Copenhagen - long parallel edges, but with a pronounced triangular tip. Large long-swords appear frequently in German art of the same period, but usually not quite of the exaggerated Danish proportions. This morning I came across the effigy of Ghese von Bibow, dated 1445, which shows the extra-long grip and curved cross so common among Scandinavian swords. Perhaps not coincidentally, the effigy is from the far North of Germany, in Mecklenburg on the Baltic coast. 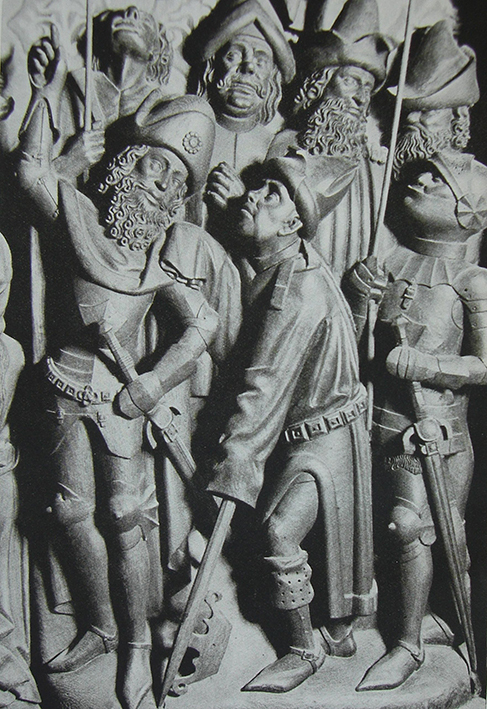 Another German example of a particularly large sword, again from Mecklenburg, appears on the effigy of Wilhelm von Werle, d. 1436. From just a little farther east, in Vorpommern, we find an example of a sword with the upturned quillons apparently common in Danish swords, but seemingly rare elsewhere. The correlation between the style and the Scandinavian-Baltic region seems quite strong. Another example from Saxony-Anhalt, farther South, breaks the trend however. Henning von den Roden, 1414. Yeah the "Boringholm-style quillons" (Oakeshott family K) are appearing on Danish church paintings from possibly late 1300 well into 1500's so over 100 years. With some possibly turning into C-guard quillons like the Hinge Swords (D4445 and D4446)? Blades on them changes through time and good spotting that D4850 in Copenhagen share the features of "long parallel edges with a pronounced triangular tip". The two Mecklenburg examples looks what you would expect from a non-ricassoed Danish-Two-Hander. Albrecht III of Mecklenburg was in fact Swedish King from 1364-1389 (until defeated by Danish Queen Margrethe I). Being in the Baltic influences in weapons must have gone both ways. The upturned quillon sword showing up in Vorpommern and Sachsen-Anhalt does show to a distribution center from Danish and Northern Germany and east into Modern Poland. These areas in the East were primarily settled by Saxons during the middle ages as far as I remember (Danes concentrated on Rügen). I think the Saxony-Anhalt population were to some extend Saxons forced moved from their North German home (having borders with the Danes and the Wends) by Charlemagne and moved south. So probably didn't have much attachment and had no problem mass migrating away eastwards. So it seems this style of quillons have a marked Danish/Saxony core based on what we know currently. 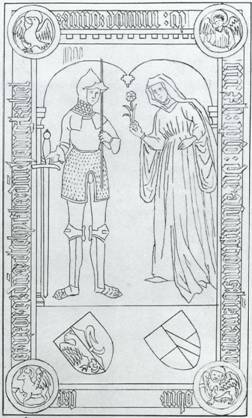 Looking at some Danish epitaphs with two-handed swords. 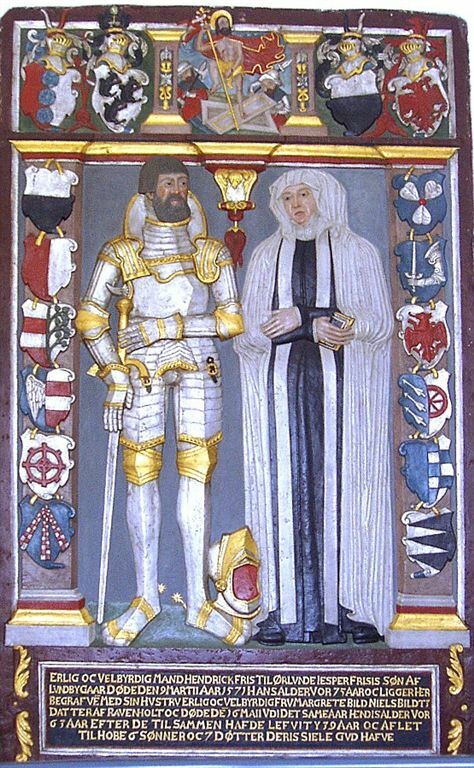 Here is Henrik Friis til Ørlunde - written Hendrick Fris - (1496-1571) and his wife Margrethe Bild from Hesselager Kirke. Nice two-handed sword with forward curving quillons (maybe C-guard like as the Hinge swords?) and a ball like pommel. So since he died in 1571, this must definitely be a depiction of the sword he carried in his youth 1520-30's? Sadly his hands is placed so we can't see if it has a ricasso or not. What cool armour he wears by the way! Henrik Friis was the brother of the more famous Johan Friis (1494-1570) who became the Chancellor of the post-Reformation Copenhagen University in 1537. He was also the Kings Chancellor and member of the Danish Rigsråd. Under King Frederik II he basically ruled the country as the King has little interest in politics. The third sword is from Roskilde Cathedral found on the coffin of King Christian I in 1843. The grip had wood and brass-thread preserved when found and also a leather scabbard with an inside of "lærred" (weaved fabric) which had rusted onto the blade. 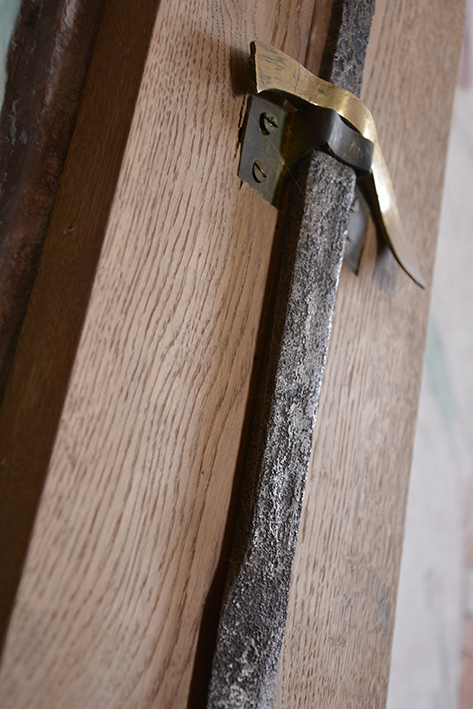 Neither grip wood, brass nor scabbard was conserved. Cross-guard: Gilded bronze. One end broken, The other end is "båndformet" (band-shaped ?) and bent forwards. Original length estimated at 15,7 cm. Ricasso: 17 cm [4-sided with a flat 2 cm wide fuller]. Stamped marks on both grip and ricasso. Is on display in Roskilde Cathedral. Niels i had a chance to examine and measure this sword last year, and the measurement i took does not match those by Ada Brunn Hoffmeyer. The sword is said to be 133,5cm long total. but in fact its 1292mm long in total. The grip is not 30cm long either but 220mm and 275mm including the pommel. The blade is 1005mm from tip to crossguard. The Blade is 35mm wide at the widest part just below the Ricasso and about 13mm thick in the center. The Ricasso is 18,5cm long and between 25-28mm wide and 10mm thick. The crossguard that is broken would originally have been about 158-160mm wide. the only measurements that actually matches Ada Brunns measurements. So how is your opinion of its handling and balance? So strange Ada Bruhn Hoffmeyer got the measurements that much wrong? 4 cm to long in total length. Blade length 3 cm to short. Blade width 2,5 cm to wide. Ricasso 1,5 cm to short. She only got the pommel 0,5 cm to long and is almost correct with the crossguard length. 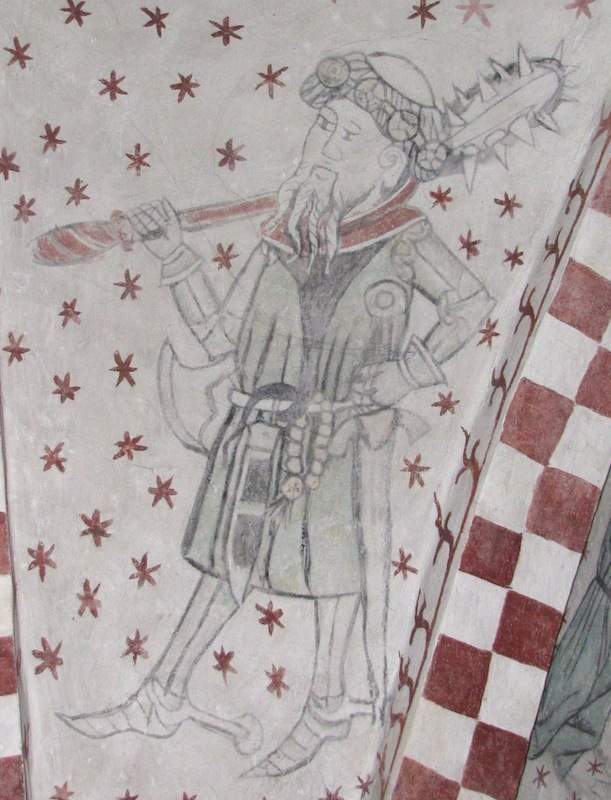 Did she perhaps measure it "by eye" where it was hanging in the Roskilde Domkirke, as that is really sloppy work to be so off if you actually had the sword in your hand?? i did not exactly have it in my hand. the sword is mounted on a wooden plank that cannot be removed without great difficulty. And the plank is mounted about 5-5,5m above the floor. So i was standing on a tall ladder. And took measurements and notes and photos from that. Still i dont think my measurements is more than maybe a few mm of on the total length, not like Ada Brunn Hoffmeyers 40mm. I think the sword could quite surely be dated to the mid 1460ties. And its quite tantalising to imagine that the sword was was worn and used by the King at either the battle of Harakker 1463 or Brunkeberg 1471. The king died in 1481 where the sword was placed on top of his casket. 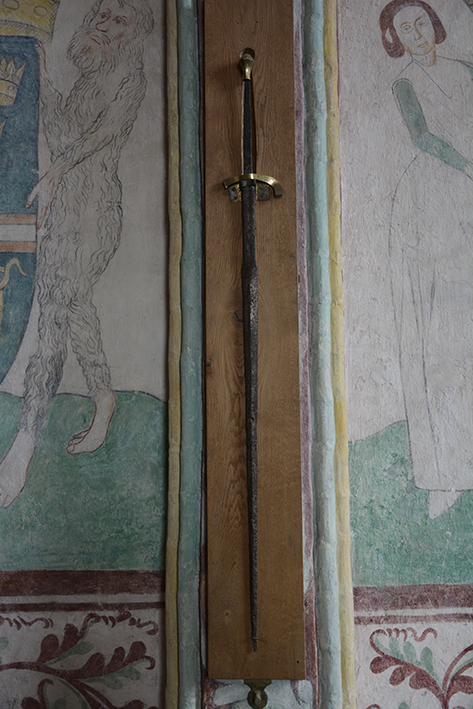 The closest comparison to the King sword in Roskilde i have been able to find in period art is the Lütjenburger altar dated 1467 in Schleswig-Holstein, Plön. The sword on the figure on the right bears a very strong resemblance with the kings sword, and pretty much shows how the sword would have looked like when in use. Also the sword on the left is of the same type but with a more gently curved crossguard. more photos of the king sword in Roskilde Cathedral. Great pictures Per. Thanks a lot for sharing them! Yep that sword is really nailed firmly! 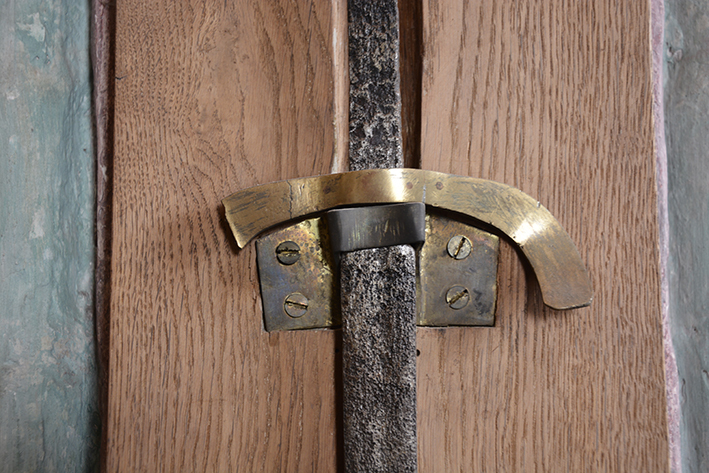 It shows that the preserved quillon of the sword of Christian I actually curves outwards like the Hinge Swords (so a weak C-guard). That the other quillons are broken exactly at that curvature actually makes me think that originally the quillons were straight and then later they were curved into a C-guard, thus causing some metal fatigue? Mark found that one of the Swedish swords had quillons that probably were bend secondarily. So maybe my hypothesis that 'Danish-two-hander' -> 'C-guard swords' might not be totally far fetched. Shame with the altar from St. Michaelis Kirche in Lütjenburg, that the two men both have the swords in their scabbards so we can't see the whether they have a ricasso or not! They both have a rainguard, so that is significant! Hi Niels, i think its highly unlikely that the quillons was curved secondarily, as the king died in 1481 where the sword was put in his grave and therefore did not have so long a working life as many other swords and weapons. What I meant by "secondarily" was perhaps bending according to new quillon fashion (as we have seen on one Swedish sword) and not secondarily in the case of wear/use. Maybe the quillons were originally made with a slight C-guard curvature style (as with the Hinge Swords) and it is just broken in some kind of combat or training exercise? 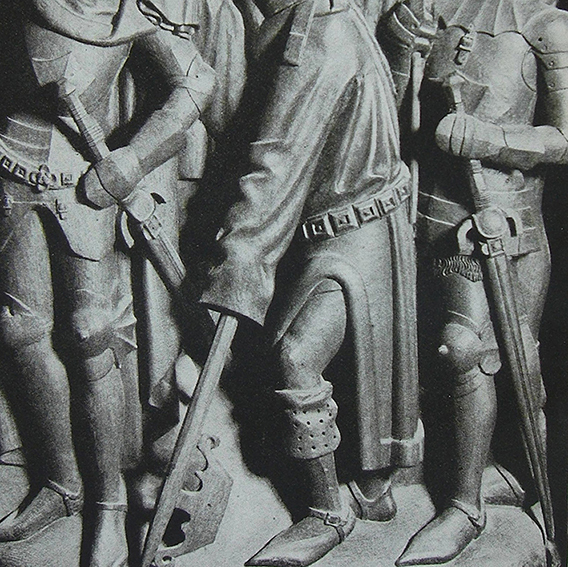 Making a research of Danish epitaphs and gravestones it becomes clear that most gravestones depicting men with weapons and armour are post 1550. Up until sometime in the middle 1500's it seems to have been most common to have just the coat of arms, but no personal depictions. Also those that survive from this early period are very very worn from people trampling on them for hundred of years, so especially the old drawings of Søren Abildgaard from the 1700's are critical for discerning details (though he doesn't always seem totally accurate). So this gravestone is from Sankt Hans Kirke in Odense and depicts Gert Hartvigsen Bryske og Elsebe Kabel. He was høvedsmand in Nykøbing Falster (1423) and later at Næsbyhoved and in the Danish "Rigsråd" from 1432. So resting a big sword in one hand. Precisely in 1441 the peasants north of the Limfjord in Jutland went into revolt under their leader - the nobleman Henrik Tagesen Reventlow, who actually ordered the rebels into a Hussite wagon defense tactics, but was smashed by Danish King Christoffer III of Bavaria. The King apparently knew how to counter this technique and it is speculated that the King's knights stormed the wagon defenses on foot. He has just the most amazing overkill of weaponry ready. It is precisely dated 1474, so 30 years after the rebellion and in 1534 under Skipper Clement the Vendsyssel people would make their most famous rebellion! But for our discussion the sword is interesting! Looks also like Hinge-style-quillons and has a rainguard! Same family, same armour, same sword from Hesselager Kirke? Answer is NO to second and third. Epitaph of his son Jesper Friis (1539-1561), whom drowned in "Lunde Mølledam" just 8 days after his sister Maren Friis (1545-1561 - on the right) had died! What a family tragedy! Notice that the two swords have different pommels. A bit more ball-shaped for Henrik Friis, while the sword of Henrik Friis has a more sharply angular pommel. Also the armour varies in the collar. Henrik Friis has an armour with a collar providing neck protection, while Henrik Friis has a collar proving protection for neck and both sides. Sadly even Jesper Friis has a hand placed, so you can't discern whether the sword has a ricasso or not. The similarity between sword and armour is surprisingly great, so it actually took me some time to realized they were not identical. Maybe both sword and armour were ordered by both father and son at the same time from the same place? The painting is dated 1550-1560. One of the quillons looks "Branch-like". In the other hand Goliath holds a very peculiar pole weapon - ends in a huge broad spear with an axehead and spike under it. Gudom Kirke - dated 1550-1560.